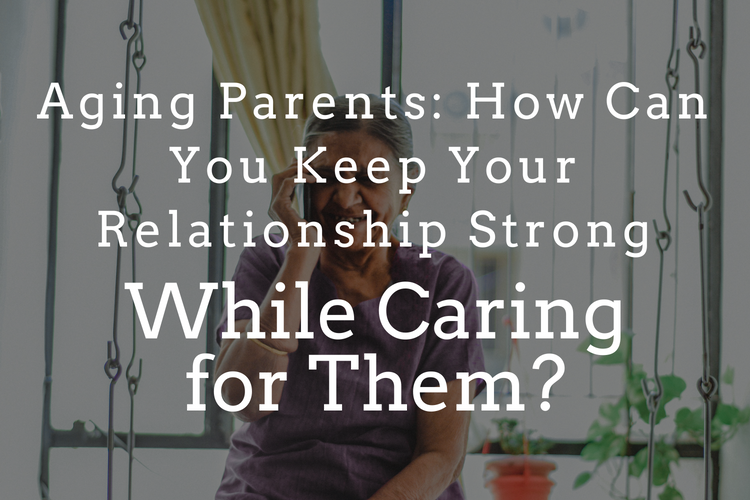 It’s no secret that caring for your aging parents is a tough gig. Especially while also trying to nurture your relationship with your partner. This is a situation many of our clients in San Francisco struggle with. And that’s because caring for an aging parent can cause a big strain in your other relationships, especially the most intimate one between you and your partner. Your responsibilities might become unbalanced as they vie for your attention. Which is understandable and to be expected, but there are things you can do that may help even the scales so your relationship doesn’t suffer. Caring for your aging parents is an incredibly tough job. Understand that, at times, you’re not going to be your best self through this process. You may find yourself being more irritable and less patient in your relationship. Small things that used to roll off your back may seem like a big deal now. You might even sense more conflict between you and your partner. Remember that throughout all this, there is nothing wrong with you. More than anything, the overwhelming stress you feel means you’re a living and breathing human being. In other words, you’re absolutely normal. Keep in mind, too, the roles have been reversed between you and your aging parents. You are now the one taking care of them. From the outside, it might seem like the natural progression of things. But, it can actually bring up a lot of conflicting emotions. For example, your parents might have been less than adequate parents. Perhaps you experienced abuse or neglect in your youth. Feelings from those old wounds may resurface making you more prone to be emotionally reactive. And these complicated layers in your relationship could leave you feeling incredibly overwhelmed. So, be compassionate with yourself. And take note of your daily personal habits. Something as simple as a good night’s sleep is foundational to your well-being. Also, nourishing meals and physical movement will go long way in keeping you emotionally balanced. Along with establishing a healthy routine to take care of yourself, there’s another routine on which you need to turn your attention. It doesn’t matter if you’ve been together with your partner for one year or 30 years, dedicated time with each other will always be important. For many couples in San Francisco, caring for an aging parent frequently involves long travel back home, taking time off work or managing care from afar, and fielding phone calls during your already busy day. While for some couples, caring for an aging parent may involve visiting the hospital every other night, relocating them to a nursing home, or even moving them in with you. It’s vital for you and your partner to take a serious time out for each other. Carve out time for just you two whenever you can. Go away for the weekend or take a day trip somewhere beautiful. Go out for dinner at your favorite restaurant where talk of your aging parents is forbidden. Because of the hefty emotional and mental load you carry, your current circumstances could dominate most of your conversations. Sometimes you might really need to unload or simply hash out the details of your situation with your partner. You can save that for another time. Keep this special part of your lives separate from the situation with your aging parents so you can reconnect with each other. In doing so, you’re creating intimacy. And intimacy is what you need now more than ever. We each have a way of handling our own parents. This means that most times it’s best to just let the relationship between parent and child run its course. If your partner is the one caring for their aging parents, then you have the unique job of letting them do their thing. You might think you have a better way of handling things. And maybe you do. But it’s important to give them the space to work through it their own way. By choosing this route, you’re respecting their complicated history as parent and child. Though there might be coats piled in your kitchen, unfamiliar scents in your home, and a dozen shoes by the door, keep your cool. Caring for aging parents often involves the entire family. Again, let your partner and their extended family make whatever decisions feel right for them, even if you don’t agree. To support your partner or family member, ask them if they want your opinion rather than just giving it freely. Sometimes the best thing you can do is to keep quiet. Remember: this situation isn’t about you. So, commit to pausing before offering your advice or opinion and ask yourself if that’s the best way to be supportive. Need help keeping your relationship strong while caring for aging parents? Call (415) 310-5142 to get started with one of our San Francisco couples therapist.